We stock the largest selection of wadding and cotton batting in the UK. For example, we hold the Hobbs, Warm & Natural, Quilters Dream, June Tailor and Vilene (Vlieseline) wadding ranges. Our knowledgable staff will be able to help you with the correct wadding choice for your particular patchwork and quilting project. The decision to use a cotton wadding, polyester wadding or a mixed blend really comes down to personal preference. Some quilters prefer to use cotton because it is a natural product, but it will shrink slightly (which may be a desired effect), (e.g. Hobbs Heirloom Wadding). Polyester will not shrink and is well suited to projects that will be washed regularly (e.g. Quilters Dream Wadding). A mixed blend can offer the benefits of both types in a reduced way (e.g. 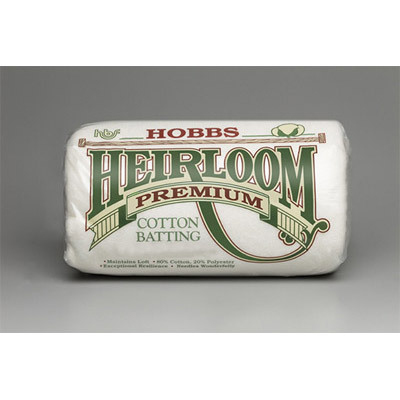 Hobbs Heirloom Premium Wadding). We have made a wadding ebook which you can browse that contains lots of details on our waddings, their characteristics and how to use them. We have two sample packs of waddings so that you can judge which is the best wadding for your project and our staff will be able to give you tips and guidance. You can browse our entire range of patchwork and quilting waddings online here. The majority of our waddings come in four pre packed sizes, crib, twin, queen and king sized waddings. These relate to the finished size of the quilt, but you can use wadding tapes to join waddings together. As well as wadding tape we have a number of other wadding accessories such as wadding scissors that allow you cut your waddings much more easily. But if you are looking for wadding (also called batting in the US) then you have come to the right place, and we ship throughout Europe. We currently supply cotton waddings, wool waddings, silk waddings, bamboo waddings, polyester waddings, recycled waddings and waddings with a blend of natural and man made materials.